An unknown number of nuclear warheads. Stockpiles of weapons-grade plutonium and highly enriched uranium. ICBMs. Weapons factories — and the scientists who work at them. The list of what it would take for the "complete denuclearization" of North Korea is long. North Korea has said it's willing to deal away its entire nuclear arsenal if the United States provides it with a reliable security assurance and other benefits. But there is lingering skepticism ahead of Tuesday's summit between President Donald Trump and North Korean leader Kim Jong Un that Kim would fully give up the nuclear weapons he has pushed so hard to build. It wouldn't be hard to hide at least some of the warheads and radioactive materials in the country's vast complex of underground facilities. The size of North Korea's nuclear arsenal is a mystery, with estimates ranging from 10 bombs to as many as 60 to 70. How sophisticated they are is also unclear. It's one thing to conduct a nuclear test — North Korea has carried out six underground explosions since 2006, including what it says were two hydrogen bomb tests. It's another thing to make the warheads small enough to be carried by a long-range missile that can strike the U.S. mainland. Kim said last November that his country had mastered that technology, and many foreign experts and governments believe North Korea is at least getting there. "They are close enough now in their capabilities that from a U.S. policy perspective we ought to behave as if we are on the cusp of them achieving" the ability to strike the United States, then-CIA Director Mike Pompeo said in October. Closer to home, many analysts believe North Korea is able to mount nuclear weapons on shorter-range missiles that could reach South Korea and Japan, where 80,000 American troops are stationed. Nuclear bombs can be made from plutonium or highly enriched uranium, and North Korea has both. A 2016 South Korean government report says that North Korea is believed to have produced 50 kilograms (110 pounds) of weaponized plutonium, enough for six to 10 bombs. North Korea shut down the plutonium-producing factory at its main nuclear complex in Nyongbyon in 2007 as part a disarmament-for-aid deal, but the accord later fell apart, and satellite imagery indicates the North has resumed extracting plutonium in recent years. Plutonium plants are generally large and generate much heat, making it easier for outsiders to detect. A uranium-enrichment plant is more compact and can be easily hidden from satellite cameras. The centrifuges to enrich uranium can be clandestinely operated underground. Stanford University scholars, including nuclear physicist Siegfried Hecker who visited North Korea's centrifuge facility at Nyongbyon in 2010, recently wrote that North Korea is estimated to have a highly enriched uranium inventory of 250 to 500 kilograms (550 to 1,100 pounds), sufficient for 25 to 30 nuclear devices. South Korean and U.S. experts speculate North Korea may be running several additional uranium-enrichment plants. It doesn't take much plutonium or highly enriched uranium to make a bomb, and North Korea could hide some of either or both in the more than 10,000 underground tunnels and structures it is reported to have. About 6 to 8 kilograms (13 to 18 pounds) of plutonium is needed to make a bomb, which would be about the size of a softball, according to experts. 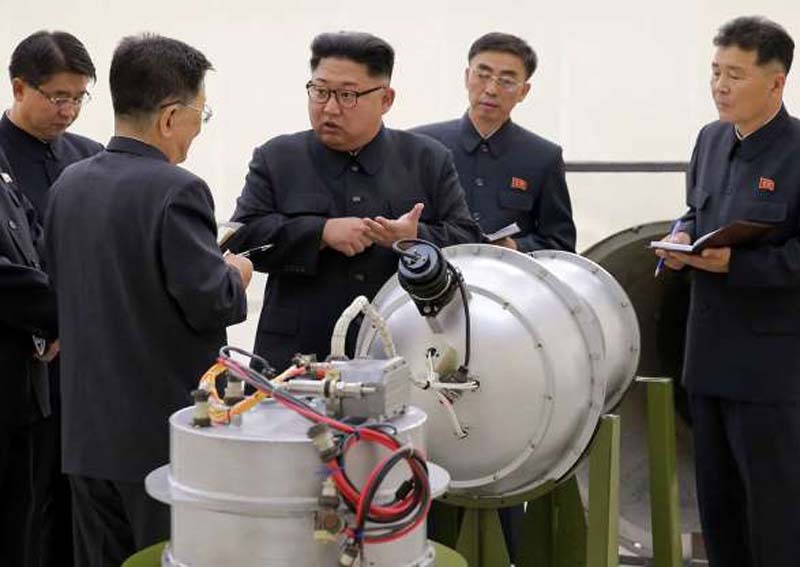 For highly-enriched uranium, it's about 20 kilograms (44 pounds) for a bomb about as big as a 1-liter (1-quart) water bottle, says nuclear expert Whang Joo-ho of South Korea's Kyung Hee University. The United States would want North Korea to include any intercontinental ballistic missiles in its disarmament steps as they are the delivery vehicles for nuclear weapons targeting the U.S. mainland. Last year, North Korea test-launched three ICBMs that it says are all nuclear-capable. Experts say, though, that North Korea has yet to demonstrate the technology needed to protect its bombs from the severe heat and pressure that a long-range missile is subjected to on returning to the Earth's atmosphere. Lee Choon Geun, a missile expert from South Korea's Science and Technology Policy Institute, says he believes that North Korea has "several but less than 10 ICBMs." Most of the key nuclear facilities are at the Nyongbyon complex, about 100 kilometers (60 miles) north of Pyongyang. They include a 5-megawatt, Soviet-designed reactor; a radiochemical laboratory where weapons-grade plutonium can be extracted from spent fuel rods and centrifuges to enrich uranium. Military commentator Lee Illwoo said denuclearization measures would also have to include closing off uranium mines in North Korea. In May, North Korea demolished its sole nuclear test site deep in the northeastern mountain in a show of commitment to denuclearization. But the closing of the Punggye-ri site in the presence of a small group of foreign journalists isn't an irreversible move and experts say many other significant measures should follow to realize the country's complete denuclearization. In a 2017 report, Lim Young Nam at Seoul's state-run Nuclear Safety and Security Commission said more than 10,000 people work in nuclear-related sectors in North Korea. About 300 of them were believed to be directly involved in the development of nuclear weapons, he said. Lim says that relocating key nuclear scientists and engineers to other sectors is as important as scrapping nuclear warheads. Adds Whang, if they are left intact, North Korea could enrich uranium and build new bombs "in a year or two."